I didn't post yesterday. Gasp! I usually try to write at least a little something every day but I was drawing blanks yesterday! Harper took a FOUR hour nap yesterday (which I wasted almost all that time) and then we ran a few errands and there just wasn't much to write about. Today - we had a fun day. We met up with five friends for lunch. These girls all know at least one other girl in the group but we all were meeting someone new today (if that makes sense). We all read each other's blogs and just finally decided to get together. I had so much fun - these are the sweetest girls! 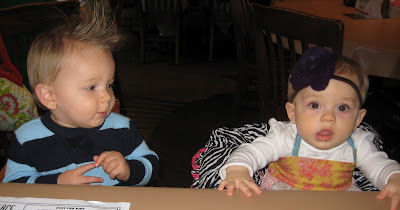 Harper got to have lunch again with her future boyfriend Brody. They are SO cute together! I love this pictures it's like Brody is telling a funny story and Harper is thinking "I don't get it". ha! I think they were both thinking "where is the food?" in this one. Brody started eating string cheese and Harper was SUPER jealous. They are 3 months apart and I could just eat them up! Jennifer and Brody -isn't he just the CUTEST thing???? and I'm thankful for this girl! And totally unrelated - I finally bit the bullet and bought some "skinny" jeans. I love the whole jeans tucked in the boots look and I'm going to try it. I jumped on the whole scarf thing.....let's go all the way and do the skinny jeans, boots and scarf! ha! I'm not sure if a 35 year old kind of chubby girl (me) can pull off "skinny" jeans but I'm going to try. ha! Maybe I should call them "wish I was skinny jeans" or "if I ever worked out instead of eating cake while watching Biggest Loser I might BE skinny jeans" or "I like food too much to ever be very skinny jeans". ha! Kelly - You're blazing the trail for the rest of us "30 something wish we were skinnier" ladies! :) Now you have to post a picture with your new look! Harper is a doll! I am too scared to try skinny jeans because I have "carrot" legs. They are large at the top and super skinny around the ankle. Where did you get your's? You crack me up... you are so not "kind of chubby"... please, you are adorable and you look amazing for having a child less than a year ago. My youngest just turned four... I won't even think about the skinny jeans! I love Harper's outfit, it's too much! I can totally relate to the re-naming of the skinny jeans. My twins are 13 months old and I wish I could get rid of the last 5 pounds. I love reading your blog and appreciate your spirit! I think Harper looks like she just thinks he is ridiculous or something like that, you know the look we sometimes give men, LOL.I love her outfit. Oh my friend from school is having another baby and it makes me jealous, is that normal that I want another baby and Aidan will just be 8 months tomorrow. Thanks for the great lunch today! It was great to see you and catch up. I hope we can get one more lunch date before your big trip. I got skinny jeans and I would have to say that I love them. I hope you like them just as much as I do! I just caved and bought some skinny jeans too. What I found was that my enormously wide hips didn't look that good in them unless I wore a longer top that kind of hid them and balanced everything out. Then it was not so bad! 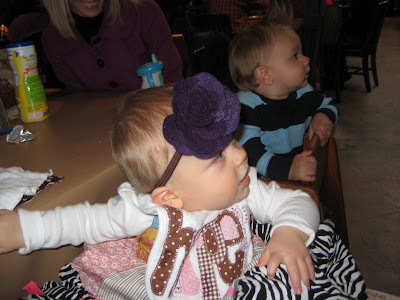 PS: LOVE Harper's felt headband!! Lunch with friends is always so much fun! Brody and Harper are sooo cute. I love her Fall dress. I am sure you are going to look cute in the skinny jeans. You look darling in everything! Now, if only my pregnant behind could get into them! And, I am sure you will be asked this 100 times, but where did you buy Harper's dress at that she is wearing today? It is precious!!! You will rock the skinny jeans! I love those boots in that picture!!! 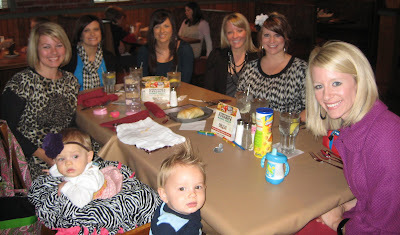 Kelly--I also read Jennifer's blog and think that Brody is the cutest little boy ever! And, you can totally pull of the skinny jeans and boots!! You had me cracking up over the skinny jeans comment. I'm going to have to buy a new pair of skinnies. I was wearing some super cute size 0 skinny jeans BEFORE having London last year, and there isn't a prayer of those fitting this year! haha! I'm not going to complain about buying a 2 though. LOOOOOVE Haper's MJ. We love them. I can't wait to see the new stuff coming out in November! That was too funny about the skinny jeans! I am glad to know that I am not the only one snacking while watching The Biggest Loser. I love food way too much to ever be skinny enough for skinny jeans, but i bet you will rock them! You are soooo not chubby! I don't think I could pull off skinny jeans but love boots with jeans too and am on the look out for some cute not too expensive brown boots. Glad you had a fun lunch. Love Harper't little outfit. Your so funny!! LOVE the skinny jeans look too, it's too cute! 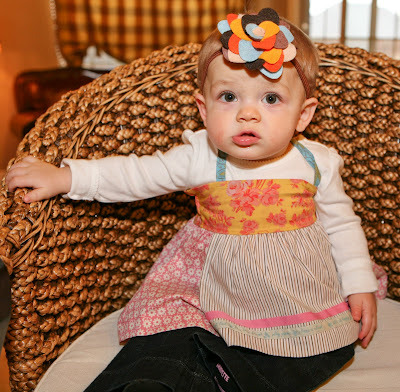 Harper's outfit and headbands are adorable!!! Hope y'all are trying to stay dry! It's still raining in TN over the river! I bought my first pair of skinny jeans a couple weekends ago. For a girl who has always avoided anything "tight" it was quite the switch. I definitely wanted some tall brown boots though and figured I had to get both. So I did and I'm so glad! I bet you'll look great! I can't even handle how cute her top is!! Glad you had a fun lunch!! Don't feel guilty about "wasting" nap time! You need that time!! I love, love, LOVE Haper's top. Thanks so much for telling us where it came from. It would be a great gift for my niece for Christmas! And we totally ate cookies this last Tuesday while watching the biggest loser, ha! Too cute! I love Harper's outfit! I'll have to check out that site for Lauyrn. Have a great weekend! I was totally not ready for skinny jeans either...BUT! I "arrived" last season and it is all that I wear! I love them, and I actually FEEL skinnier in them! Harper is adorable! You can definitely do skinny jeans!!! Crazy as it may be, my very favorite skinny jeans are from Forever 21 and were $13.99. I wear them all the time. They are the most comfortable jeans I've ever owned. I love the boots tucked into jeans look, too. And, you look great!! !Happy almost weekend!! Ok seriously, 35?!?! You honestly look 25!!!! You are cracking me up today girl! I love all of the pics. It's so nice to get together with girlfriends! 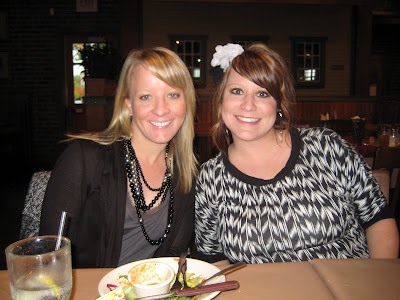 I'm meeting up with other bloggers this weekend in Atlanta! It's going to be fabulous. You will LOVE the skinny jeans with boots. I am now addicted to the skinnies. Do you know where those boots came from??? Hi Kelly, You can certainly do the skinny jeans. I am to old for that look again. Like you said...been through that fad once, but not again. Harper is styling today. Her future husband is a cutie! Glad you had such a fun lunch. Girl lunches are the best. Keeping you in my heart in Ga.
Kelly, I forgot to ask if you saw the write up on Ree Drummond in the new Southern Living? It was real good and included some recipes. Hey!! You go on with your "skinny jeans" self...I can't do it. I just can't....my thinking is that skinny jeans are for skinny people and that, my friend, I AM NOT! I ordered about 20 of those shirts from your friend you go to church with...the one like Harper had on with the candy corns! I can't wait to see them!!!! Thanks for the info! You are NOT a chubby girl. I think you look at least 10 years younger, so you should have no problem pulling off the skinny jeans with your skinny self! You're gorgeous, and I'm certain your new wardrobe pieces will reflect that! By the way, every Tues. I ALWAYS eat junk food while watching The Biggest Loser--usually ice cream, this week pizza (gotta switch it up sometimes!). At first it was ironic, now it's just a semi-shameful weekly ritual! Great pics of your friends and Harper's future hubby is too cute! hahah loved the comment about eating cake while watching the biggest loser...sooo me! oh and loved harpers top! oh my stars, harper's outfit is SO CUTE!! do they make them for big people too?? I have been wanting to jump on the putting pants into boots train but i'm too afeared. Maybe if you look ok doing it i will try!! alright, i'm cracking up. seriously. those last few sentences killed me! :) i can so relate-- haven't tried the skinny jeans in boots look yet and am afraid to! hips need some boot cut jeans! harper is looking mighty precious! Hi Kelly, you are so lucky to live by all of those amazing bloggers. I read all of their blogs, all sweethearts. I am sure you will look fab in the skinny jeans, you will have post pics! I LOVE the jeans! So cute -maybe I need some too. Lunch looked like so much fun. I love going to lunch with other moms because they get it. I have been cooped up most of the day with very little adult interaction - lunch sounds fabulous. 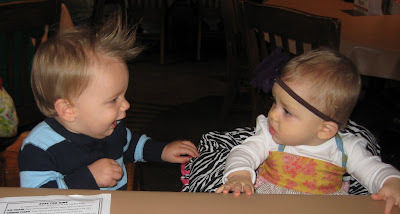 Looks like an awesome day out with friends:) It looks like Brody and Harper are having some deep discussions. Don't you wish you knew what they were thinking at times like that? 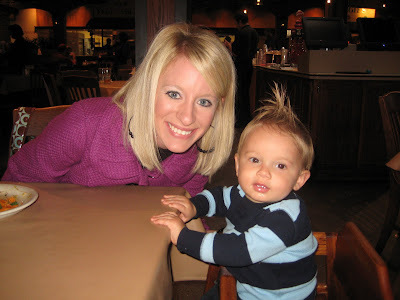 And even when you think you are having a boring day, I love reading about other Mom/baby days...every day with a baby is special, so thanks for sharing yours. I am anxious to hear if you like your "skinny jeans"....I've been debating getting them myself! They do look so cute with boots!! Love, love, love Harper's top. It is so cute! I think you will be just fine in the skinny jeans. I eat "nongood for you" foods during The Biggest Loser too! Ha! Eating lunch with friends is one of my favorite things to do! I love that you are always willing to try the latest fashion styles...you look great in whatever you wear. I have no doubt the skinny jeans will look fab too! Girl, there is NO WAY my behind will ever be caught in a pair of skinny jeans!!! Oh my goodness...Harper has more style than I do and she's just a babe!!! She looks simply adorable in that little top and headband!! I wear skinny jeans and tuck them into boots, too cute! I think everyone can fit into skinny jeans and look cute with the right accessories! Harper is too cute!! I feel withdrawals when I don't get a new post everyday! ha! I'm glad ya'll had a great lunch date! Harper and Brody looked to cute! Ya didn't have to tell me that was Matilda Jane! I'm a big fan of Matilda Jane so I knew right away... Ha! My BFF is having a trunk party next week and I can't wait to get lots of cute stuff for Kelcee. I think you could soooo rock skinny jeans! I had some skinny jeans before I got pregnant and had a baby 9 months ago ... The good old days ... I'd have to think heave-age, think ho-age to get them on again now! What a FUN lunch! Matilda Jane has great things! I'm sure you will look super cute in the skinny jeans! Love the skinny jeans! I think you'll be suprised at how flattering they really are...I know I was shocked that I could actually pull them off! Glad I'm not the only one who watches Biggest Loser and eats all the things they say not to while I'm doing it! Kelly, you're funny! I haven't been brave enough to buy "skinny jeans". I wore them when I was younger - but not since this belly has stretched it's way out 9 times. I'm with you, I DO like the skinny jeans and boots look - maybe I'll give it a try too. If you post pictures of yourself, maybe you'll make me feel brave enough too. I bet you'll look adorable - because you do in everything else you wear. Girl, you rock those skinny jeans! I just gave in and bought a pair too because I got a pair of Uggs. I am not the slender self I was pre-children but there's no reason we can't be awesome and trendy too. And for what it's worth, I think you look great! You are beautiful and will totally rock skinny jeans!!!! You should check out operationbeautiful.com It is a wonderful idea, and there are some great videos, especially the Tri Delt videos. As women, we should all do more to encourage each other to feel comfortable in our own skin. PS. Love reading your blog. I check it every day. 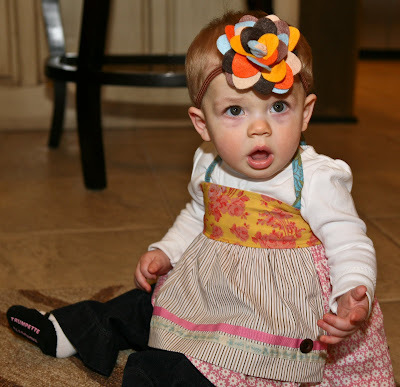 Harper's Matilda Jane top and that felt bow are so cute! And I'm sure you can pull off the skinny jeans. We had such a great time with you girls today! I really love when we get Brody and Harper together...it is so fun to watch them interact! I LOVED her MJ top and felt flower! She looked precious! oh kelly!! you crack me up ... skinny jeans only refers to the cut (i know you knew that) and honestly, i LOVE LOVE LOVE the look of skinny jeans on ladies with some hips and tooshie ... me being one of them. we can roll them up, tuck them in or wear with flats and STILL have a cut figure!! no boyish figure for us hippie girls! i love your blog ... seriously. continues to give me hope that someday we too will be blessed with a little angel. Kelly, Don't you worry I watch the biggest loser and eat ice cream almost every season its on! LOL! Although tonight I did work out on our treadmill. I just wanted you to know, your not the only one! Cake, Ice cream, cookies what ever lil sweet treat I can find. Harper is so cute, I love her expressions. And your right about that first pic she is thinking that about his "story"! I LOVE LOVE LOVE the first picture of Harper in this post. She's such a doll and that outfit!! 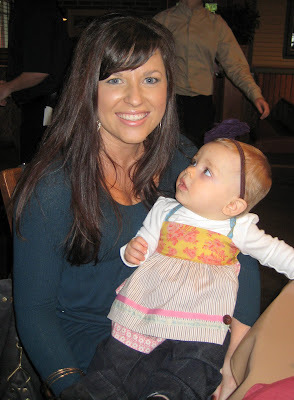 I am not sure that I have ever commented here other than to let you know I was praying for Harper during her first days and weeks but I had to say that I totally relate to the "eating cake while watching Biggest Loser" thing except mine is ice cream! I even laughed out loud a little bit! i love the skinny jean and boots look too! i think you can totally rock it. i was skeptical at first but i love them now. where did you find that picture? i love those boots! You're too funny! You sound like me when I'm watching the Dallas Cowboy Cheerleaders show and stuffing my face. Harper and Brody are adorable together!! I JUST bought my first pair of 'skinny jeans' too! It felt so funny wearing them the first time but I HAD to have them to go with my super cute boots I bought too and I was so against that style last year but it has finally found a place in my heart I guess!! And don't worry about your age, you do not look anywhere near 35 so I think you will be ok in your scarf and skinny jeans! Ann Taylor has the best skinny jeans for real women. I'm a size 16...and they make me look and feel like an 8! Love them! Did you see Oprah yesterday? She had a bit on jeans...CJ's jeans are expensive but apparently feel like sweats! That's what I'm talking about! :) For the budget conscious person...try Lee's at JC Penny. They have all styles...! Happy Shoppin'!! I have been wearing this look for a few years now but this year am getting new brown boots and actual skinny jeans for them...I typically just use tight normal jeans. I also plan wear with a white shirt and big brown belt...cant wait! ps Love the Matilda top! p.s. I enjoy your blog so much and am learning alot about what my Durham will be doing soon by watching Harper grow! I follow your blog and have never posted before, but had to after reading this post! I laughed out loud at the "eating cake while watching biggest loser" because that is a weekly tradition in our house! Harper's outfit is too cute for words! I love the headband! DItto for the skinny jeans! I am trying to eat healthy and exercise, so maybe I can achieve that look eventually...because I love it!